*Prices are indicative and depend on the current gold price, the ring sizes, and the current EURO/DOLLAR currency. Shipping costs included, US and Canadian tax rates excluded. Please note that persons who hold a Canadian First Nations status card and live and work on their reserve are generally tax exempt. In Anishinaabe thought, the countless phenomena, forms, and forces of the natural world specific to man’s immediate environment are chiefly to be interpreted in a cosmological context. All life forms are considered (more or less) animated and inter-related “persons” or “relatives” possessing a consciousness, rationale, and a will of their own. A human being or rock or a tree or a fish or a rain cloud are all seen as persons. All life forms are equally possessed by a spirit and a soul and a mind and there is simply no distinction between human or nonhuman. In spite of the general Native American belief that a person – be it a man, an animal, a plant, a stone, or a rainbow - consists of three parts, being: body (the physical part), spirit/soul (the consciousness associated with the person), and a mind (which resides in the brain), Zhaawano's Anishinaabe ancestors sometimes distinguished at least four different component parts in each life form that are, to varying degrees, interchangeable. These components were called: wiiyaw, which is the outward manifestation of self (the body, which may de-materialize into jiibay, or a ghost, after death); jichaag or ojichaagoma, which is a person’s true life force (spirit and soul, the core of self); jiiban, or a perceptual essence called “shadow” (a sixth sense); and jiibaaman (aura), which is an entity that emanates from a person’s spirit/soul/shadow. By the same token, Zhaawano's ancestors understood that a lake, or a hill, or a tree, or a blade of grass possesses (at least some parts of) these substances as much as human beings or fish or tiny insects do. The understanding of this fluid interchanging quality of the soul and spirit of all things alive led to a belief in a suggestive, magic world inhabited by aadizookaanag (supernatural persons capable of metamorphosis) and manidoog (spirits, mysteries). The world was a dynamic Universe filled with positive as well as negative energy that, like a river, flowed through it like a spring flows clearly through the heart of mother earth. Zhaawano depicted this metaphor of a river of energy by creating – with the aid of the overlay technique - a recessed, flowing line in the top layer of the gold wedding bands. 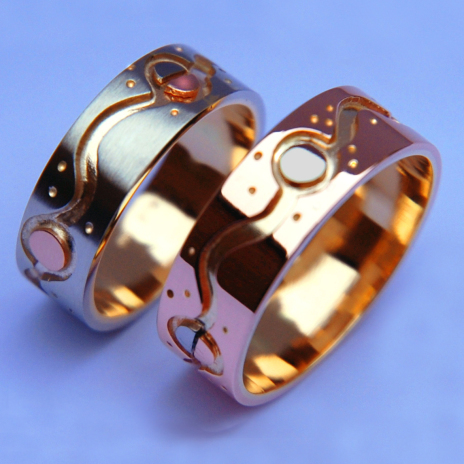 This coiling river design of yellow gold, which stands out against the respectively red gold and palladium gold surface of both wedding rings, connects three or four dancing “spirit suns” (orbs). The omnipresent vitality of these orbs that appear to dance through the Universe is emphasized by the – seemingly random - positioning of small “energy speckles” around the sun symbols.